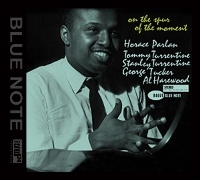 Description: The Definitive Versions of Blue Note are on XRCD24... Listen & Compare! When one is stricken with polio as a child, resulting in a partially paralyzed right hand, becoming a pianist may not seem like a logical career move. However Horace Parlan had too much soul to stay away from music, and he turned his disability into an advantage and his own personal style. After playing in r&b groups in his native Pittsburgh, in 1957 he moved to New York and impressed Charles Mingus so much that he was in his group for two years. Parlan also worked with Lou Donaldson, Booker Ervin, the Eddie Lockjaw Davis-Johnny Griffin Quintet and Rahsaan Roland Kirk before having a second life in Copenhagen, where he spent his final 30 years. Parlan's most exciting recordings were made for Blue Note, particularly the ones that teamed him with bassist George Tucker and drummer Al Harewood. The trio was so close that they created music with one mind. On The Spur Of The Moment is particularly memorable for it also features the Turrentine Brothers. Stanley Turrentine was very distinctive on tenor-sax even in the early 1960s, and he is instantly recognizable in one soulful note. Trumpeter Tommy Turrentine was a masterful bebopper and gives the set some additional fire. The combination of the Horace Parlan Trio and the Turrentines makes this rare Blue Note album into an instant classic that epitomizes the hard bop/soul jazz era. Originally released in 1961. The 24-bit super analog extended resolution compact disc (XRCD24) from JVC brings the listener higher fidelity and improved audio quality by enhancing the process of mastering and manufacturing compact discs. The XRCD24 is compatible with all CD players.